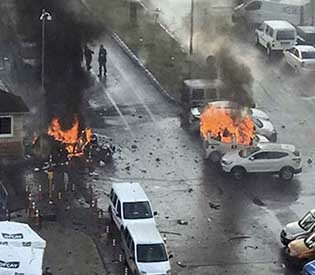 Suspected Kurdish militants on Thursday opened fire at police who stopped them at a checkpoint in the western city of Izmir before detonating their explosives-laden vehicle, the province’s governor said. Gov. Erol Ayyildiz said preliminary indications pointed to the Kurdistan Workers’ Party, or PKK, which has carried out a string of attacks in the past year and a half, mainly targeting Turkey’s security forces. Islamic State militants have also carried several deadly attacks in the country. Ayyildiz said the attackers were carrying two automatic rifles, rocket launchers and eight hand grenades. The attack occurred near a courthouse in Izmir’s Bayrakli district, close to an entrance used by judges, prosecutors and other employees. Police detonated a second vehicle found near the scene of the incident. The incident follows a string of attacks, carried out by IS or Kurdish militants, which have left Turkey on edge. On Wednesday, police had detained some 20 people in Izmir believed to have links to the nightclub attacker who is still at large. The PKK, which has been fighting an insurgency since 1984, resumed attacks in Turkey after a fragile peace process with the government collapsed in 2015. Kaynak suggested the attacks aimed to deter Turkey from its fight against the PKK in Iraq — where it regularly carries out air raids — as well as its military incursion in northern Syria where it is fighting the IS and taking steps to curb territorial advances of the Syrian Kurdish forces. As with other attacks, the prime minister’s office imposed a news blackout restricting coverage of the attack, citing public order and national security concerns.